By far as we all know Google Adsense is the best paying online marketing site. It’s Cost Per Click range from $0.01 to $1.00 but I have not seen 1$ clicks ad’s yet but they say so. Google Adsense have the hardest rules and regulation against any possible harm to there marketing industry. Daily 100 and 1000 of Company Join Google Adwords to get online marketing with them and to publicize there website to a larger scale. I will tell you 3 quick ways to increase you Google Adsense earning of per day so if you are getting 0.50 per day after reading this you will make atleast 2-3$ per day. 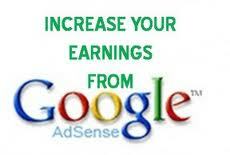 So what to do exactly to increase you daily earning with Google Adsense. 1. Get More visitors:- Getting a descent amount of traffic to your site will help you increase you earnings. I am talking about real traffic and not paid traffic. Your daily Traffic if ask mimimum should be 500-700 visitors per day. 2. Placing you Ad’s :- Here is the trick, Placing your ad’s wisely. Google Adsense allows you to place only 3 ad’s of any type on you blog but many people trick that and palce more than 3 ad’s its Not Good As it Lowers your Page views of your ad’s . 3. Using Graphical Ad’s :- Other than Text ad’s Graphical ad’s contain more money per click you can get even 0.15$ per click on graphical Ad’s. Bro not all adsense publishers can put more than 3 ads. Only PAP (Premium Adsense Publishers) have authority to put ads more than 3. No I did not find this informative. It is very less detailed and useless. Just the same old information is written and it is very crappy. Now of you are not a coward you should approve this comment because it reflects your article's quality.